China and the Vatican have signed an unprecedented agreement - after 70 years of icy relations - that allows the Chinese government to name seven Catholic bishops who will be recognized by the Pope. Rome lifted an order excommunicating them. At the same time, China is persecuting Protestants. Chinese authorities in central China's Henan province are ratcheting up pressure on unregistered churches, with at least four churches in Nanyang city being raided at the break of dawn. The largest Protestant church in Beijing was burned to the ground. Galen Carey, Vice President of the National Association of Evangelicals, told me, "Pastors are being jailed and tortured for extended periods. This persecution is deep and broadly widespread. It also involves Muslims, Protestant house churches and Catholics. I met with churches being closed down." He said that in the churches which are remaining open, cameras are being installed by the Chinese government, with "the capacity to photograph with the capability of facial recognition," so that individual church attenders can be identified and prosecuted. He added that "Pastors are being jailed and tortured for extended periods. This pattern is deep and broad, and seriously widespread." Sam Brownback, the U.S. Ambassador At large for International Religious Freedom, conducted a conference in August with participation by delegations from 87 countries who are concerned about Chinese persecution of Christians and people of other faiths. What's odd is the rapprochement of the Chinese government with the Vatican. It is opposed by "many Chinese Catholics and anti-pope conservatives," according to the national Catholic News Service. China's 10 to 12 million Catholics are divided between two communities: One that, for decades, remained underground because it did not accept compromises and political control after the Chinese Communist takeover in the 1950s. The other faction accepted some compromises and political control in order to continue its existence. Both factions were faithful to the Pope and both have faced persecution. The recent negotiations were conducted under the supervision of Cardinal Pietro Parolin, Vatican Secretary of State, and the #2 man in the Vatican, trusted by Pope Francis. The negotiations have taken five years to bear any fruit. The agreement was leaked last month to The Wall Street Journal, and then announced Sept. 22. The Chinese have named specific priests who will serve as bishops, and the Vatican has recognized their authority. It has been criticized by some, such as retired Cardinal Joseph Zen Ze-kiun, 86, who was born in Shanghai. "They're giving the flock into the mouths of wolves. It is an incredible betrayal," he told the British news agency Reuters. Pope Francis urged Chinese Christians last week to trust in his decision to unify the Roman and state-run churches, assuring his often persecuted flock that he appreciates their sacrifices but that China represented a "land of great opportunities" for the church. The Pope acknowledged "certain confusion" about his agreement but did not divulge any new details. Instead, invoking his title as the successor of Peter, he asked Chinese Catholics to "place your trust more firmly in the Lord of history and in the church's discernment of his will." He said that in bringing the seven excommunicated bishops back into full communion with Rome, "I ask them to express with concrete and visible gestures their restored unity" with the church and "to remain faithful despite any difficulties." By contrast, the Chinese government in Henan province in ratcheting up pressure on unregistered Protestant churches with the intent of shutting down on at least two-thirds of Christian churches there. There are 50 to 60 million Chinese Protestants - five times the number of Catholics. Most attend house or family churches - hundreds of which have been shut down. "This may be a central policy from Xi Jinping (the Chinese President) to stop the growth of Christianity in mainland China," says Fuk Tsang Ying, director of a divinity school in Hong Kong, which is outside of China. One target of the crackdown in Zhejiang, a province with many Protestants. 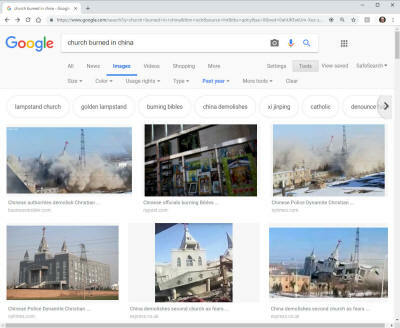 However, in that province, the Chinese government only removed the crosses of the churches on rooftops, unlike the crackdown in Henan where hundreds of churches were shut down. More than a million Muslims are believed to have been detained in massive "re-education camps." Last week nearly 30 Protestant pastors of family churches across China issued a joint statement urging Chinese authorities to stop ruthless suppression, saying "such acts of brutality have not been seen since the Cultural Revolution." We American Christians, who are blessed with total religious liberty, should pray for persecuted Chinese Christians.